BleachHouseLibrary.ie: " The Dead Ground " by Claire McGowan - Book Tour. Review and excerpt.
" 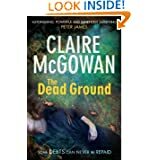 The Dead Ground " by Claire McGowan - Book Tour. Review and excerpt. Claire McGowan is back with her new Paula Maguire crime thriller. I read the first in the series last month and couldn't wait for the next instalment! I was delighted to see this pop through the letterbox and to be included in the book tour with Bookbridgr. Forensic psychologist, Paula Maguire is based in Northern Ireland and works within the Missing Persons Unit. She is called into help when a baby is stolen from the maternity ward of a local hospital, hours after its birth. Very uncomfortable with this case, for personal reasons, she struggles to keep her feelings under wrap and keep her secret to herself. Not long after the kidnapping, a woman's body is found with her stomach cut open and dumped in the snow. Things go from bad to worse, when a pregnant girl goes missing and another baby has disappeared. Are the events linked? Can Paula get into the mind of the killer? Is it too late for the missing woman and infants? Claire McGowan has delivered another clever crime thriller, hot on the heels of The Lost. Her protagonist is sharp, edgy and likeable and, once again, the author's knowledge of Northern Ireland and its border towns really make the location ideal for gritty atmospheric scenes. Paula's missing mother is still a part of the storyline and interwoven throughout the novel, making the reader desperate to know what happened to her. Her father is trying to move on with his life yet is concious of his daughters feelings. Paula is surrounded by men in her job and seems uncomfortable with female co-workers. This is a clever move by the author, as a girl who grew up without a mother would, more than likely, struggle with bonding with women. Add to that, the appalling nature of the crimes and Paula's life is one of extreme stress. I read a lot of crime thrillers and can safely say that Claire McGowan is right up there with the best of them. She doesn't feel the need to go into minute detail with each event, forgoing the technical jargon that a lot of authors depend on. This means the narrative is the main event. It's a good old fashioned who-done-it with a modern twist. Having a female perspective may be a common thread in crime fiction these days, but with Paula Maguire, you get the back story, the history of the troubles in Northern Ireland and the fantastic descriptive passages depicting a wild countryside on a small island. Well done Claire McGowan, you have definitely secured your place on bookshelves alongside Karin Slaughter and Jonathan Kellerman. The Dead ground is published by Headline and is available in all formats. It starts with the smallest thing: the beat of your heart. When everything around you is horror, you focus on that. The pulse. The life. You focus and get on with it. now this one, this one is filling you with sick fear. stumbling into your trousers in a dawn as dark as pitch. at that one raw spot on your lip. give the job up, do something else. But what else is there? Hamilton’s already there, a nervous new constable in tow. doubt. There’s no reason you should mind at all. battle line, and is cupping a fag in the icy morning air. more common than either of you would like to think. very bad, for her not to answer the phone in three days. means she can’t so much as pick up a phone to her sister. wee constable who’s all of twenty. Kevin, that’s his name. the other side. You start to walk. baby has come, and there was no one, no one at all to help. in here, son, don’t look! Get Mick – call an ambulance. will be with you till the day you lie down and die yourself. You were sure the woman would die. How could she not? in you has hardened and died too.